Why engage a cross-cultural consultant? It’s easy to be an expert in your field, yet have difficulty communicating your information to another group of people – especially across cultures. Yet when you create good relationships you create better outcomes; for clients, for staff, and for the project itself. We provide professional advice and support in our specialist area, so that you can be more effective in yours. Are you developing a project or policy that requires genuine in-depth consultation with Aboriginal communities? Do you need to ensure that community members with English as a second language are able to truly understand what you are presenting them, so that they can make informed choices? So often, mainstream community consultation does not employ sufficient cross-cultural awareness to create a real 2-way dialogue with Aboriginal communities. Linguistic and conceptual differences in culture, as well as social and behavioural differences, result in a wall of silence which is then often misinterpreted. Do you have information to deliver to an Aboriginal community, where the vast majority of people in that community are English-second language? Perhaps you need to create educational resources about a particular topic and are not sure of the most effective approach? Many organisations make the mistake of thinking that a complicated message, delivered in ‘simple English’ will be adequate. Or that putting Aboriginal art on the cover of a document will somehow make it more ‘culturally appropriate’. If Why Warriors has learnt one thing from decades of working with remote Aboriginal people, it is that they are crying out for good quality, intellectual information in a language they can understand. If you want your messages and programs to be effective and you want to be a genuine catalyst for change, then an informed cross-cultural approach is vital. Why Warriors can help you develop appropriate materials for communities, including high quality video production and radio programs (see Yolngu Radio). At the interface between different cultures, there will always be misunderstandings. The key is to identify the root of these as soon as possible, before they escalate into conflict. Aboriginal communities in Australia have had a long history of mistreatment, oppressive government policies and failed NGO programs. Without approaching communication with a cultural competent mindset, mistrust can easily form, and communication barriers will go up. With over 40 years of experience in cross-cultural mediation, we can make sure that your relationships with Aboriginal communities are positive and fruitful. How is Why Warriors different? Our ethos can be summed up in one word, Dharanganamirr; a Yolŋu word meaning “deep reciprocal recognition and understanding”. For over 40 years we have been living in Aboriginal communities, learning and sharing from a two-way, bilingual, cross-cultural perspective. We are uniquely placed to bring this experience and skill set to your projects. Several of our staff speak Yolngu Matha, the language of the Yolngu people of northeast Arnhem Land, at an academic level – some of the few people in Australia to do so. Richard Trudgen speaks legal, economic and health Yolŋu Matha and is adept at covering a wide range of subjects after many thousands of hours of working with people in a range of settings. 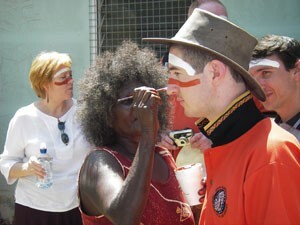 Whether it’s working in courts with Yolŋu youth facing criminal convictions, explaining legal requirements to local councils, or acting as a doctor-patient liaison for Yolngu at Royal Darwin Hospital, Richard has a long and impressive track record working as a vital bridge between Aboriginal and mainstream culture.